PS: 25 Days left until Christmas!! I made the snowman out of marshmallows, carrot piece for the nose, food gel for the buttons and eyes, and my red Betty Crocker Food Writer pen for the mouth. I used my little bone picks for his arms. I made the top hat pick by using an existing long stem pick I had. I printed a picture of a top hat clip art off the computer and attached to the pick using double sided tape. There are mini-marshmallows and cauliflower florets to look like falling/ fallen snow. The sandwich is turkey and cheese, cutout with my snowflake cookie cutter. Top right are cucumber slices and matchstick carrots. Bottom right are cantaloupe dices and blackberries. I made a cheese cutout coin with the number 25 written on it with a food writer pen to go with her advent countdown on how many days are left until Christmas, which I started on Monday's lunch post. All packed inside a handy-dandy Easylunchbox. 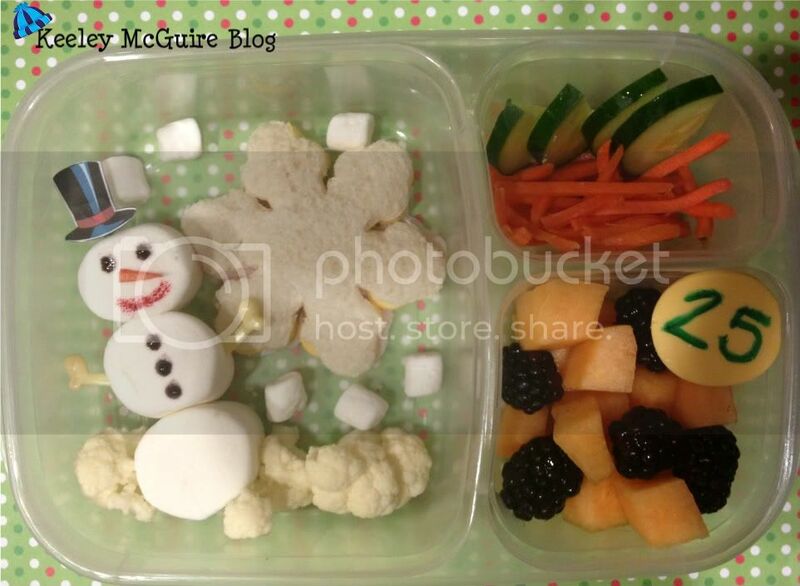 Love your snowman and veggie snow :) Too cute! Very cute snowman and hat ! Love this - you are an awesome mom! Pinning! That is a great way to get a kid to eat cauliflower. So cute!